This Steampunk series comes from our friend and celebrated designer Christian Mackey and are a Shop Geocaching exclusive. Sure, not all of these in the Steampunk Predator series will be true predators, but they will all be Steampunk Tough, and could go predator if they wanted to! These unique geocoins have incredible detail and an intricate design that truly has to be seen to be appreciated! We are going back to the future (or back to the past?) to a time when steam powered things with their unique designs were only limited by imagination. Bring some steampunk to the world with the Steampunk Predator series! These fierce and unique geocoins are trackable at Geocaching.com with a unique icon. Dimensions: Approximately 3 inches nose to tail and 2 inches top to bottom. 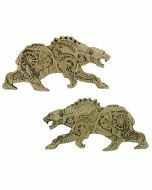 Steampunk Predators- Polar Bear- Last Chance!! !